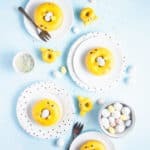 Whether you’re planning an Easter brunch or a spring morning breakfast, these chick doughnuts are every bit as easy and they are delicious! With a soft, lemon poppy seed cake doughnut base, what’s not to love about these easy treats? In a medium size bowl, combine the dry ingredients (flour, sugar, baking powder, baking soda and poppy seeds) and whisk until well mixed. In another bowl, whisk together the wet ingredients (butter, egg, milk, vanilla extract, and lemon juice/zest). Whisk the dry ingredients into the wet until the mixture is completely lump free. Pour (or pipe) the batter into greased doughnut pans and bake at 350F/175C for 9-10 minutes (or until a toothpick inserted into the doughnuts comes out clean). Once the pan is cool enough to handle (about 5 minutes), invert the pan over a cooling rack and gently shake the pan until the doughnuts come out. In a deep bowl, melt your yellow candy melts using 20 second increments in the microwave. You won’t use the whole bag, but you can melt them all and wrap up any leftovers in plastic wrap for later use. Cut two small slits into the sides of the doughnut hole. Dip the almonds into the melted candy melt and press into the slits at a slight angle. Dip each doughnut into the candy melts, allow the excess to drip off, then turn right-side-up and tap gently against the counter until the coating is smooth. If the almonds show through the candy coating, coat them a second time. Once the yellow candy coating has hardened, a little black and orange royal icing to pipe the chicks’ beaks, feet, and eyes. Optional: brush on a little pink powdered food coloring. If the candy melt coating is too thick to “glaze” the doughnuts, you can thin it with a teaspoon of vegetable shortening. The secret to a perfectly smooth candy coating is gentle tapping or shaking so that the coating becomes a smooth. Don’t be afraid to gently tap the bottom of your doughnuts against the counter until the coating has a smooth finish.